If this isn't the bottom for Election 2016, I don't want to see what the bottom is. I mean that with every fiber of my body and soul. Worse, The Bottom comes to us courtesy, I am sorry to say, of a Catholic priest -- an unethical, seemingly insane and wicked Catholic priest, but an alleged man of God nonetheless -- and his deeply ironically named, off-the-rails fanatical organization, Priests for Life. 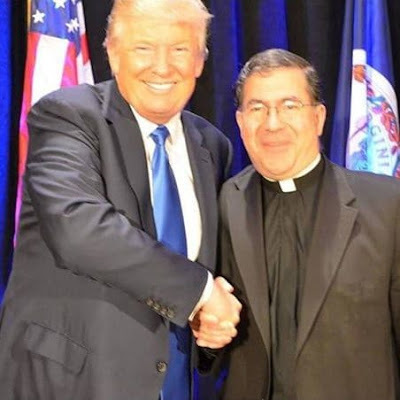 Of course, Priests for Life is completely in the tank for Donald Trump. I know I am burying the lede. I have to work up to the lede, though I imagine you can guess what it is from the obscured Facebook screenshot. Trust me, you don't want this lede upfront. NO, you don't. Steel yourself as I dawdle. What we have, courtesy of Fr. Frank Pavone, isn't just sacrilege -- it's diabolical. Diabolism in the name of Trump. God help us, that orange abomination is diabolical, literally, in his ability to inspire all those he touches to engage in naked, unapologetic wickedness. Like this. 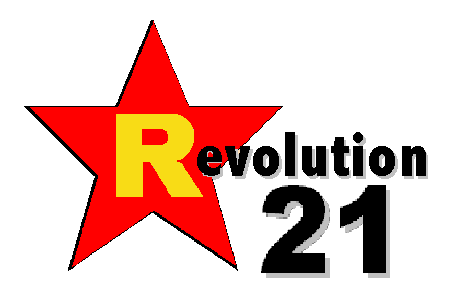 Just today, I thought I had seen the bottom of this horrible election being dredged with the news story that Trump had a 12-year-old with cerebral palsy and his mother thrown out of a Florida rally -- with the rabble assaulting them all the while. The bottom now has been dredged in the name of Jesus Christ and of being "pro-life." Upon the altar. By a Catholic priest. Ahead of Tuesday’s presidential election, the Rev. 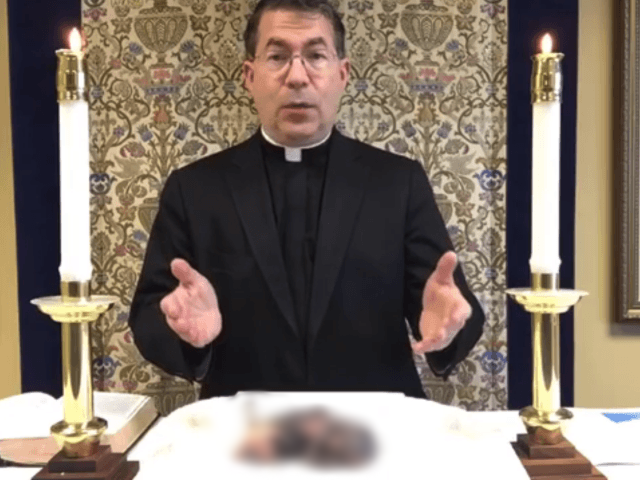 Frank Pavone took an aborted fetus, laid it upon an altar Sunday and posted a live video on Facebook. Pavone, a Catholic priest who heads New York-based Priests for Life, said the fetus was entrusted to him by a pathologist for burial. 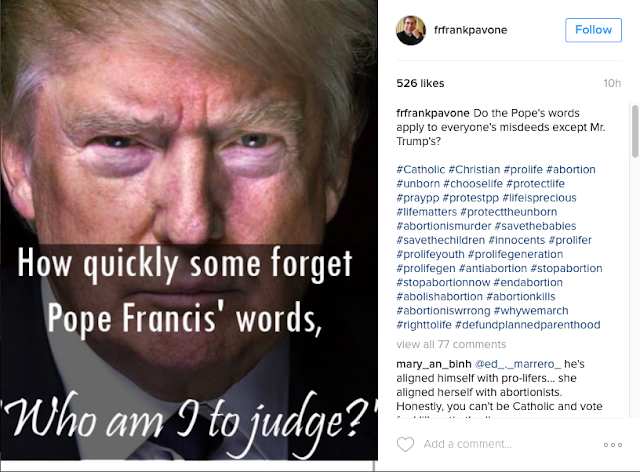 During an already heated and divisive campaign season, Pavone’s video has raised questions for some about what is appropriate antiabortion and political activism in the church. As of Monday afternoon, the video, which is 44 minutes long, had 236,000 views. In it, he holds up a poster of graphics of abortion procedures. A call placed to the spokesman for the Diocese of Amarillo in Texas, which is Pavone’s diocese, was not immediately returned Monday. The receptionist, however, said her phone has been ringing off the hook. THERE. There's your lede. In supposed defense of the right to life and the dignity of all humans, born and unborn, a Catholic priest who heads a "pro-life" organization desecrates the body of an aborted child upon the altar of God in cheap, vulgar political theater. This sacrilege -- this defiling of both a dead body and the sacred altar -- came in support of Trump, a presidential candidate who unconvincingly proclaims himself "pro-life" while advocating violence, racism, torture and state-sponsored murder of innocents abroad. 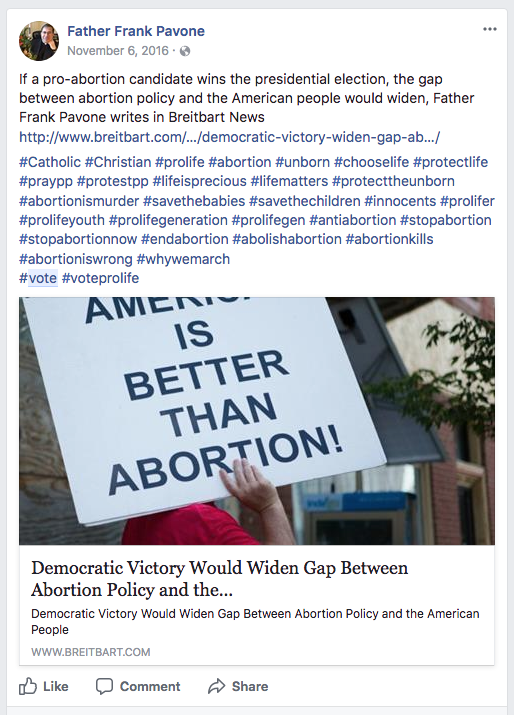 And let us not forget that Pavone's favored "pro-life" candidate is on tape bragging about numerous instances of sexual assault. C.S. Lewis would have been hard-pressed to imagine such perfidy in service of Our Father Below for a sequel to The Screwtape Letters. This . . . this is the smoke of Satan in the sanctuary, fetid incense burned in worship of Deep Cheeto. A dead, apparently saline-burned aborted child, splayed upon the altar as if at an Aztec temple. An offering to Quetzalcoatl? Mein Gott im Himmel! Somehow, it seems appropriate to express horror in the original German when speaking of Trump and his "souled-out" sycophants. I HAVEN'T felt this soul-sick -- physically ill, even -- since the worst days of the Catholic child-abuse scandals in 2002 and 2003. Then, I damned near left the church. Such has been the devilish vengeance this campaign from hell has unleashed upon the church -- upon what's left of the "pro-life" movement. This has the feeling of the devil demanding his due from a movement that sold its soul to Republican politics long ago. Feeling? One cannot tangibly prove such things, but it seems to be more like a lead-pipe cinch to me. In this church where we have been asked to cross too many bridges too damned far, a line has to be drawn. A spiritual line has to be drawn, and rotten limbs have to be cut away for the sake of the Body of Christ. Frank Pavone doesn't need to merely have his faculties suspended; he needs to have them removed completely. He needs not to be able to present himself publicly as a Catholic priest. And then let the state's criminal investigation begin.